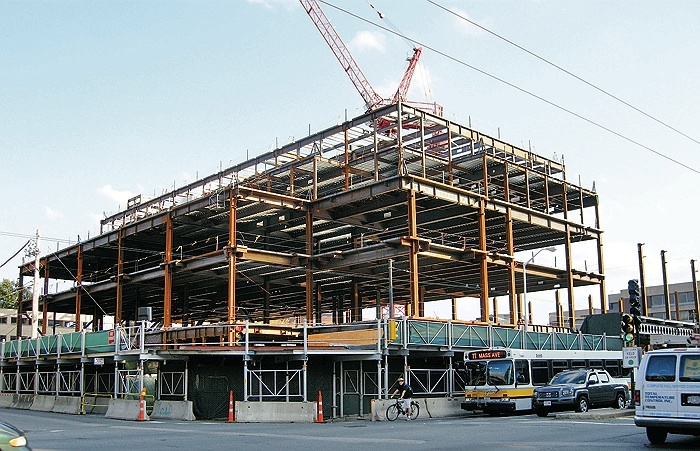 Structural steel is erected for the Law School’s Wasserstein Hall, Caspersen Student Center, and clinical-wing project on Massachusetts Avenue at Everett Street. Two 10-kilowatt wind turbines generate renewable power atop the Soldiers Field parking garage. With several major construction projects on hold or pending approval this fall, just one major new building is rising at Harvard, at the northwest corner of the Law School grounds, where the steel superstructure is expected to be complete by the end of December. But in the meantime, a variety of “green” renewable energy projects—harnessing the wind and sun—have been sprouting up around the campus fringes. When readied for the arrival of students in the fall of 2011, the new Law School building will provide a combined 250,000 square feet: in Wasserstein Hall, an academic center; in the Caspersen Student Center, with its spaces for organizations, journals and social activities; and in a wing for the school’s clinical legal programs. One block to the east, facing each other across Oxford Street, two graduate residence halls built in the 1890s, Perkins and Conant, had new fire alarms and sprinklers installed this summer. The massive Perkins Hall even got a new roof. Another street over, on Divinity Avenue, renovations to the Sherman Fairchild Biochemistry Building and the basement of the Bauer Life Sciences Building were pending. If approved, the space would be ready for occupancy by members of the new department of stem cell and regenerative biology as soon as 2011. They were originally scheduled to be principal tenants of the first Allston science complex (see below). Directly south, also awaiting approval, is the planned renovation and expansion of the Harvard Art Museum to enlarge the Fogg and Busch-Reisinger and equip them with modern climate controls and safety and security equipment. Across the Charles River in Allston, at the site of what was to have been Harvard’s first science building there, the cavernous underground basement has been decked over with steel panels, and the towering cranes that dotted the site are gone. Throughout October, workers applied a mesh of rebar above the steel decking to which they added a concrete cap. The resulting expanse of smooth concrete pad with steel I-beams jutting out is a forlorn reminder of the University’s current financial reverses. 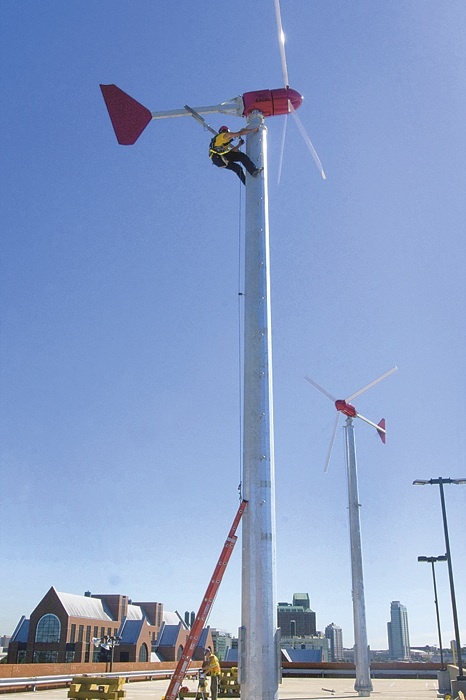 But on a happier, sustainable note, two 10-kilowatt wind turbines, weighing a thousand pounds apiece, have been erected atop 40-foot steel towers on the roof of the Soldiers Field parking garage between the Business School and Western Avenue. Visible even from the Cambridge campus, the turbines trace 23-foot arcs and are the University’s largest wind project to date, dwarfing the six single-kilowatt turbines atop Holyoke Center. Not far away, in Watertown, where the University owns a complex of buildings that once comprised a U.S. Army arsenal, preparations for the installation of solar panels on the roof of 311 Arsenal Street are under way. The roof of this enormous, almost-two-centuries-old munitions factory, now filled with commercial tenants, will be home to the largest institutional solar array in New England: a 500-kilowatt grid two and half football fields in length. When fully operational, the installation will provide 635, 272 kilowatts of green energy per year, enough to power 33 single-family homes. The building’s carbon emissions will be reduced by 238 metric tons annually: the equivalent of taking 43 cars off the road each year. This is the kind of construction that Harvard will be doing a lot more of as it strives to achieve the goal of reducing its greenhouse-gas emissions by 30 percent by 2016.